You don't soon forget when you've seen a ghost; you definitely don't soon forget when you've seen The Ghost. 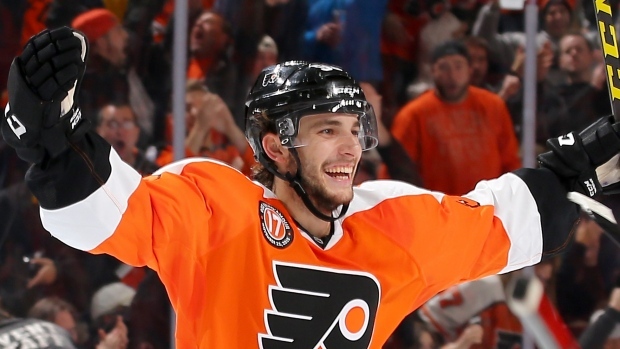 The Ghost, of course, is Shayne Gostisbehere‎, the Philadelphia Flyers' 22-year-old rookie defenceman who may well be one of the most exciting, dynamic and unique young players in the NHL. In nine games since being called up to the Flyers from Lehigh Valley in the American Hockey League, Philadelphia has gone 5-2-2. Gostisbehere has four goals and six points, including three power-play goals (two of them overtime game-winners) while playing 17 to 20 minutes‎ a night. The Ghost can't be the only reason the Flyers have suddenly become relevant again in the Eastern Conference, but the Margate, Fla., native who played his minor hockey in the Florida Panthers' practice rink in Coral Springs is nothing if not, by nature, a catalyst. He's a fascinating study, everything from his name and how to pronounce it, to his heritage, ‎to the way he plays. First, the name. The correct pronunciation, according to him, is Gostis-BUH‎-HAHR. At least that's how it sounded when he said it over the phone. Gostisbehere led the upstart Union College Dutchmen to the NCAA Frozen Four national championship. "I even have trouble saying it like that," he said. Most everyone, including him, favour and just go with Gostis-BEAR. The kid is a true blue American - he played for Team USA at the 2013 World Junior Championship and won gold there - but he has a lot of French (as in France) as well as French-Canadian blood coursing through those veins. That explains a lot because there aren't many players with as much flash and dash as as this Franco-American. Gostisbehere's father, Regis, was born and raised in southwest France. As a young man, he came to the United States, Florida specifically, to be a professional jai alai player, where he met and married Shayne's mother Christine, who worked at the jai alai venue in south Florida. Regis Gostisbehere suffered a serious eye injury‎ when Shayne was only two and had to retire from the sport. Shayne can thank his father for dual American-French citizenship and the exotic-sounding surname. He can thank his mother's side of the family, notably his maternal grandfather‎, Denis Brodeur, for exposing him to hockey at a young age. Denis Brodeur (no relation), I kid you not. Though when Gostisbehere‎ pronounces it, it sounds more like Dennis Broder. "My grandfather lived in Montreal and he was a huge Montreal Canadiens fan," Gostisbehere said. ‎"But he moved the family to Florida. That's where my Mom grew up. My Grandpa is the one who put me into hockey. It was because of him." Shayne doesn't speak French, but wishes he did. He still plays the game, though, in the true spirit of a Flying Frenchman. Being a great skater apparently runs in the family - his sister Felicia was an elite-calibre national figure skater in the U.S. who tried to qualify for the 2012 Olympics, though injuries have since forced her to retire. Still, Shayne remembers going with his parents to Felicia's 4:30am, before-school, private skating lessons, where he'd roll himself up into a sleeping bag and sleep while his sister skated. He played his minor hockey in south Florida, first for the Coral Springs Coyotes, later for the Florida Junior Panthers. At age 16, he left home to play prep school hockey at South Kent in Connecticut, where he earned notice from college recruiters - he accepted an offer to go to Union College in Schenectady, N.Y. - as well as an NHL scout John Riley of the Philadelphia Flyers. Gostisbehere wasn't drafted out of prep school when he was 18 years old, but a year later, after his freshman season at Union, the Flyers stepped up and took him in the third round of the 2012 draft. Riley had continued to be a big advocate for the dynamic defenceman who was flying all over the ice and playing more like a rover. Third round was probably a lot higher than anyone anticipated Gostisbehere being selected but the Flyers wanted to make sure they got him. 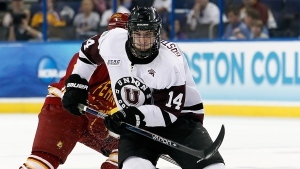 In his junior year, Gostisbehere led the upstart Union College Dutchmen to the NCAA Frozen Four national championship. He opted to forgo his senior college season to sign with the Flyers. But in his first year as a pro, early last season, he blew out his ACL. He started this season in the AHL, but injuries and a losing record got him the call up. His impact has been striking. It would be foolish to suggest he alone has been the reason for the Flyers' resurgence of late, but it's difficult not to look at his influence on the power play and those two OT GWGs, to say nothing of the smile on Claude Giroux's face when the captain is out there saucering seam passes to The Ghost for the one timer. Gostisbehere is still feeling his way. He's listed as 5-11, 160 pounds on his nhl.com profile page. He claims he's closer to 5-11 1/2 and 185 pounds. In any case, by NHL defencemen standards, he's considered "light." All the better, I suppose, for The Ghost to float at warp speed by his opponents. He's a marvellous skater who has incredible pop in his stride, but being "light" doesn't in any way diminish how "heavy" his shot is. Whether it's the high wind-up clapper or the less showy wrister/snapper, they all mean business. Gostisbehere is part of an offensive blueliner vanguard that will eventually transform the Flyer blueline into something that could be special. He'll one day be joined by first-round picks Travis Sanheim and Ivan Provorov, amongst others. In the meantime, he's still learning the NHL game, how to pick his spots, when to go for it, when not to, and how to play effectively when he doesn't have the puck, but he's already establishing himself as an offensive force or threat each time he's on the ice, especially on the power play. His signature trademark is destined to be the high-in-the-sky, Dany Heatley-style locked and loaded posture, which he often embraces as soon as he gets into the offensive zone, signalling he wants that puck on his stick. Check out his first NHL goal. His second and third NHL goals were absolutely identical, orchestrated, both literally and figuratively, by Giroux, who drew up the four-on-three OT power play on the whiteboard and then went out and executed them to a perfection. Look at Wayne Simmonds' net-front presence; Jake Voracek rolling to the top to allow The Ghost to sell a faux centre-lane net drive, pulling back to be ready for the fade-away, against-the-grain, far-side clapper on what can only be described a perfect saucer seam pass from Giroux. Not once, but twice - here and here. "There are actually several options on that play," Gostisbehere. "It just so happens it was the exact same play twice." Then, last night in Ottawa, he scored the first goal of the game to get the Flyers on their way. Here it is. I want to say I'm surprised by The Ghost, but I'm not. Remember when I talked about never forgetting when you see a ghost. Well, I won't soon forget seeing The Ghost? For me, it was April 12, 2014, the night Gostisbehere led Union to the upset win over Minnesota in the Frozen Four final. It was the final weekend of the NHL regular season and on this Saturday night, I couldn't change the channel from the college game to the pros. The Ghost wouldn't let me. It was one of the most riveting and exciting hockey games I've ever seen at any level. Gostisbehere's performance that night was as dynamic and dominant as I've seen from any individual in any game. He had one goal, three points, five shots on goals and was plus-7 in the 7-4 win. He owned the game every time he was on the ice. It's too early to put unreasonable expectations on a somewhat undersized NHL defenceman with a grand total of 11 games, but in admittedly limited viewing, The Ghost looks like he could be scary good.